Bigpoint reveals today the thirteenth playable character in the science fiction oriented MOBA game, Shards of War. Bastion, the first melee based Sentinel, is an unstoppable juggernaut focusing on space control, initiation and the ability to sustain heavy damage to stay in the heat of battle. Not a Sentinel of many words, Bastion lets its massive body do the talking. It expresses itself by either hitting out in a cone in front with its Primary Attack, or by slamming the ground around with itself with the Seismic Punch, damaging and slowing all enemies in reach. An array of disabling and sustaining abilities keeps it in the fight longer than other Sentinels. It should be approached with caution as, using its Concussive Blast, it can knock enemies into walls leaving them stunned and damaged. 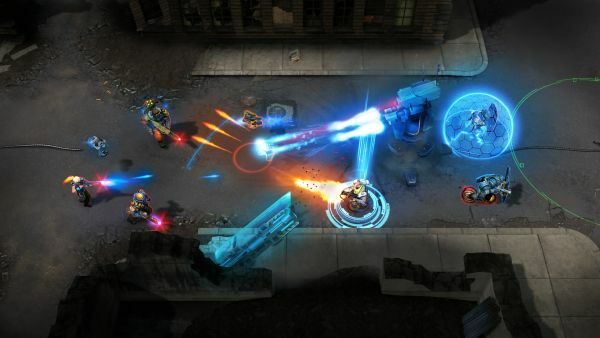 Enemies should also fear its rapid entrance onto a crowded battlefield with its split-second Impact Crater skill, whilst the Steel Maelstrom ability allows it to spin at extreme speeds dealing damage and healing itself at the same time. In short – Bastion is a specialist in terrain control. Barely avoiding the destruction of its home, Bastion made it to the Prime Shard heavily damaged. It’s only thanks to Gemini that its severely damaged chassis was returned to functionality. Whereas its speech center remains scrambled, its weapon systems do not. This leaves more than enough options to thunder out a simple message to the armies of the Black Sun when its words cannot: there are always more battles, and more enemies to come. For more info, visit www.shardsofwar.com. Simply known as “Deceit,” this is a multiplayer horror game that’s all about trust and deception rather than stealth and brute force.